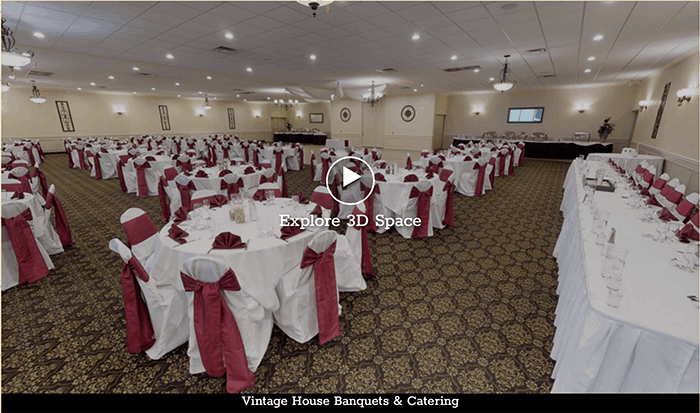 Experience a 3D 360 degree virtual tour of our banquet center! Please click the video below for a jaw dropping 360 video of our facility and see why we are the Eastside’s premier destination for wedding, corporate events and more. The Vintage House can accommodate weddings, showers, corporate events, fundraisers, reunions, funeral luncheons, sports banquets, and bar/bat mitzvahs. Our goal is to make every event a special one with great quality food and excellent service. Let our professional sales staff be your event planner and enable you to relax and enjoy the party. Our menus give plenty of selections for you to choose from.